Bagyong Ruby updates and forecasts as of Monday, December 8, 2014 are provided by state weather bureau PAGASA. View the details on this page. In its 5 a.m. bulletin, the weather agency said Typhoon Ruby has weakened while traversing Sibuyan Sea. At 4 a.m., its eye was spotted 110 kilometers northwest of Masbate City or 50 km northeast of Romblon, Romblon with maximum sustained winds of 120 kilometers per hour near the center and gustiness of up to 150 kph. It is forecast to move west northwest at 10 kph. Residents in low-lying and mountainous areas are alerted against possible flashfloods and landslides. Likewise, those living along the coast are warned on the occurrence of big waves associated with Storm Surge which may reach up to 2 meters. Expected third landfall will be in Northern Mindoro between 6 to 8 pm Monday. It will be associated with strong winds, storm surge and moderate to heavy rainfall, PAGASA said. Estimated rainfall amount is from 5 to 15 millimeters per hour (moderate to heavy) within the 450-km diameter of the typhoon. Bagyong Ruby and the Northeast Monsoon will cause rough to very rough sea conditions over the seaboards of Luzon and Visayas. Fisherfolks and those using small sea craft are advised not to venture out over the said seaboards. The typhoon is expected to exit the Philippine Area of Responsibility by Thursday morning. PAGASA said Metro Manila, Calabarzon and the provinces of Bulacan, Bataan, Mindoro, Camarines, Marinduque, Romblon, Aklan, Capiz and Biliran Island will experience stormy weather. 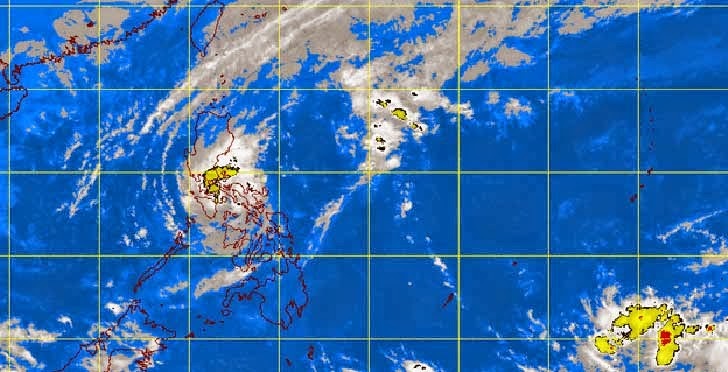 The rest of Western Visayas, Central Luzon and Of Bicol Region and the Provinces of Northern Samar and Northern Palawan will have rains with gusty winds with moderate to rough seas. The rest of Luzon and Visayas will have cloudy skies with light to moderate rainshowers and thunderstorms. Mindanao will be partly cloudy to cloudy with isolated rainshowers or thunderstorms. Moderate to strong winds blowing from the northeast will prevail over the rest of Luzon and coming from the northeast to northwest over the rest of country with moderate to rough seas, PAGASA added.